Tom Steyer is a Democrat who wants Democrats to win in November, but he isn't listening to party leaders who want him to stop talking about impeachment. Driving the news: Steyer told Politico's Edward-Isaac Dovere that Democrats (like Nancy Pelosi) "have normalized this presidency" by not calling for impeachment, and he argues they're writing off younger voters in particular who largely support it. An April poll from NPR/PBS NewsHour/Marist found 47% of Democratic voters would "definitely vote against" a Congressional candidate who wants to impeach President Trump. Moderate Democratic candidates aren't even talking about President Trump on the campaign trail. And if they are, the DCCC suggests they show "a willingness to work with the President when his agenda might help the district." Steyer's impeachment petition has collected 5.4 million signatures. His team told Politico that among the impeachment supports, there are approximately 10,000 voters in all 75 of NextGen America's targeted House districts, many of which are considered swing voters. 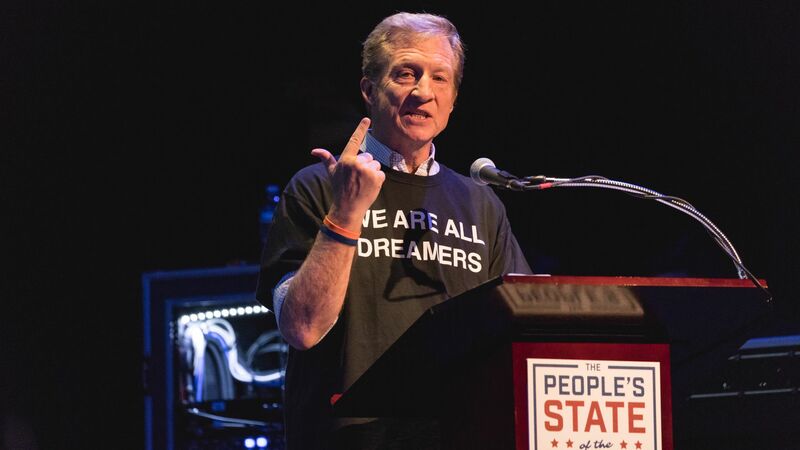 By the numbers, per Politico: Steyer has spent $40 million on nine TV ads about impeachment, he's hired more than 500 staffers across the country, and he's visiting at least 30 cities to hold impeachment town halls with voters. Bottom line: Tom Steyer's not going anywhere — if anything, he's expanding his impeachment campaign ahead of the November election.